Sorry I forgot this last one of the Svitzer Ferriby returning after carrying out a job. I really appreciate your assistance. The photos are just what I needed. Now if I can just execute some of the details..
Making some progress on wheelhouse roof details. Many thanks to Kev30 for the photos. 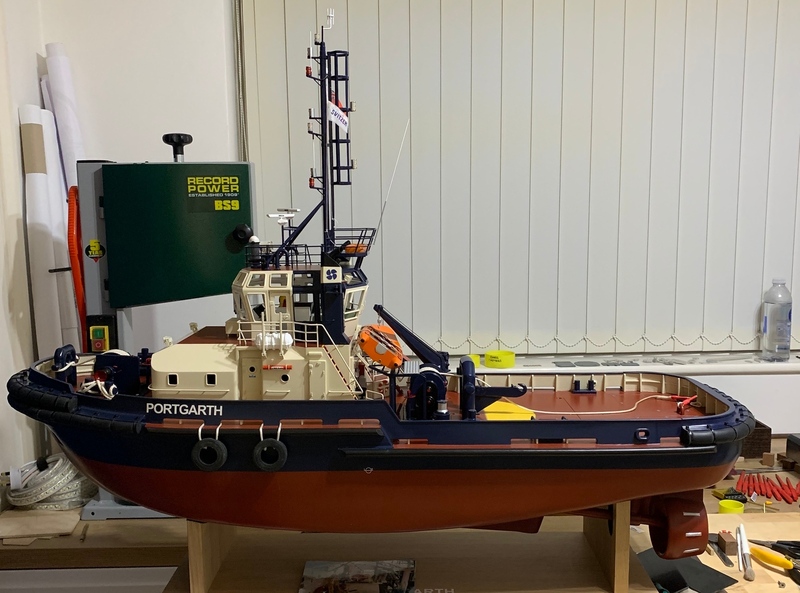 I see from your photos that you have installed the glazing in the wheelhouse windows - I am always interested in how people tackle this particular task. It appears that you have achieved a combination of flush-looking glazing (requires making up individual windows), along with raised framing, and rounded corners. All this, and the wheelhouse is painted inside and out, without any overspray or dirt marks on the "glass". Can you please give us an overview on your construction methods to achieve this result - I certainly haven't worked out how to achieve the combination of flush glazing along with rounded corners and raised framing. I can achieve any two of the three outcomes, but not all three. I readily admit I struggled with construction of the wheelhouse. I have completed entire builds in the time I have invested in it. I spent a lot of time just thinking about how to construct it. I ended up building it in individual sections which proved to be quite difficult & time consuming. I did simplify things when I got to the P&S house top side panels by constructing the panel in one piece and cutting the windows out with a scroll saw. Would follow that procedure for everything if I ever did something similar.The compound angles of the house increased the degree of difficulty. I will have to look for pictures if I have them that illustrate how I built it. For now, here are ways I proceeded. Outside was sprayed with a rattle can...inside with brush. Glazing done in individual pieces and glued in place using canopy cement which dries clear. Outside trim is 24 ga insulated wire which can be stretched and formed into round corners ( as cut, the corners were square). I was able to hide a lot of missteps with that technique. On the subject of Kevins generous photos. I could not have built my Svitzer anything like close. I found some photos of the wheelhouse construction. It was framed in individual sections which looking back was probably not an efficient way to do it. Before the glazing was installed everything had been painted. Card stock templates for the glazing were made before the 0.40” thick polyester plastic was cut & glued into place. The pdf-file contains a general arangement drawing with a plan view of the wheelhouse. At the aft end of the wheelhouse is a stair to the deck below. Additionally Damen provides a virtual tour of the ASD 24. 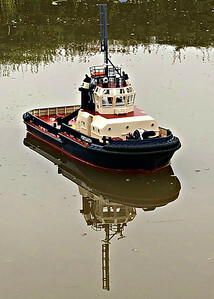 One can navigate over the complete tug. One can adjust the camera angle. I did see those Damen references. Unfortunately by the time I saw them it was too late to add the wheelhouse stairs or even create a hint of them. Not at all.I wish I had seen it earlier, but sometimes timing does not work out.